Another excellent way for those seeking to have some paint removal or rust removal. Soda Blasting is a safer more gentle method. So if the surface you need to be ready for some surface preparation is delicate, this is very well option that is best for you. 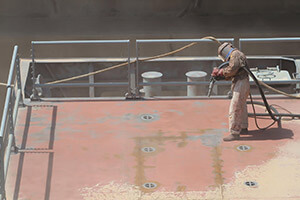 That is because soda blasting is known as a non-destructive means of abrasive blasting. It is far milder than sandblasting, so you don’t have to worry about dents or other possible damage to your surface. So if you think or worry about sandblasting hurting your delicate body panels on your car, boat or even your home and equipment then soda blasting is an excellent choice for your paint or rust removal needs. What Exactly is Soda Blasting? It is a type of surface preparation in the same vein as sandblasting that uses sodium bicarbonate as the blasting medium. You may recognize sodium bicarbonate as it is more commonly referred to as baking soda. Hence the name soda blasting. This is accomplished by having compressed air that pushes out the particles of the sodium bicarbonate. It is far less harsh on your surfaces than say sandblasting or even dustless blasting so if something you need to have abrasive blasting on is old or fragile then this may be an excellent option for you to use. It will also clean and deodorize a surface so perfect even for mold and fire or smoke damaged areas. As I have mentioned, it is done by compressed air pushing out the particles of sodium bicarbonate. However what makes it less harmful than sandblasting other than the use of a softer blasting medium is also the blasting pressure. A regular sandblasting compressor will push out the sand at 120 PSI while with soda blasting is only coming out at 20 PSI. That is a considerable difference which really does affect the force on the surface the abrasive blasting does on your property. However, it is still what we would call friable which means it is harsh on the paint but not on the material. It will only remove surface contaminants while also cleaning and deodorizing. Because soda blasting is not harmful to the surface you are using it on it is an excellent method to use when you worry about causing damage. You won't have to worry about dent or divots forming or pieces chipping away. That will only cause you more money, but soda blasting will avoid all of that. Plus because soda blasting will also clean and deodorize the surface, it is often used where mold and fire or smoke damage may be. It is also commonly used in the food processing industry to clean equipment as well because of its cleaning abilities. So it is great for so many different applications. So if you need a surface prepared that is fragile, then soda blasting is the only choice for you. As well if you need a surface cleaned away from mold or fire damage. So if sick of the smell of smoke or mold then you would be right by choosing soda blasting and having us do this for you.